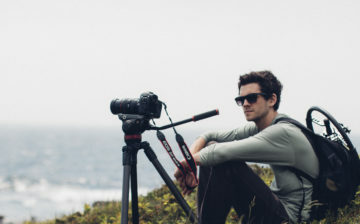 Maine Media is committed to providing financial assistance to its MFA students, Professional Certificate in Visual Storytelling students and Certificate in Collaborative Filmmaking students (US citizens only) as they pursue their craft. To that end, the following loan programs have been implemented for students enrolled in those programs. For information on scholarships, please click here. Full-time students may apply for loans from a minimum of $1,000 to a maximum of $9,000. All loan proceeds will be applied to tuition and lab fees. No loan dollars will be distributed directly to the student at any time to be used for class materials, personal expenses, travel, or off campus housing expenses. Loan proceeds will be pro-rated. No loan $ is available for the 1st trimester of the program. No loan $ will be applied unless the 1st trimester is paid in full before the beginning of the 2nd trimester. A loan maximum of $4,500 is available for the 2nd trimester of study. The balance of the 2nd trimester must be paid in full in order to continue to the 3rd trimester. A loan maximum of $9,000 (less any loan proceeds used for the 2nd trimester) is available for the 3rd trimester of study. Loan repayment begins 60 days after completion of the program, or in the case of withdrawal, 60 days from program withdrawal date. In the case of withdrawal, the loan balance will be adjusted to whatever funds are owed to the school at time of withdrawal. Payment is required whether or not a passing grade in the class was received. Monthly payment amounts will be set at the time the loan agreement is signed. The maximum loan length is 60 months, negotiated at time of approval. Interest is accrued at less than prevailing bank rates and will also be determined at the time of loan approval. Students must maintain a cumulative GPA of 2.0 in order to keep their financial aid. Failure to maintain this GPA may result in loss of funding. Students under the age of 24, single, no dependents, are required to provide parental financial information and tax returns as is currently required by the FAFSA application. Students with insufficient credit to sign a loan on their own merit will be required to have a loan co-signer. In the event a co-signer is required, financial information of the co-signer will be required. Loan limits: $10,000 total loan with no more than 50% of total credits registered for each term deferred to loan. In order to be eligible to continue in the loan program, other balances must be kept current. Loan proceeds are for project tuition. All retreat fees, workshops tuition, housing, and meal plans must be paid at time of attendance. Loan repayment begins 60 days after completion of the program, or in the case of withdrawal, 60 days from program withdrawal date. In the case of withdrawal the loan balance will be adjusted to all funds owed to the school at time of withdrawal. Payment is required whether or not a passing grade on the project was received. Monthly payment amounts will be set at the time the loan agreement is signed. All signed loan agreements must be in place before a student can register or work with their mentor on their final thesis. The final 9 credits must be completed within a 12 month period. Loan repayment will begin at the end of 12 months plus 60 days regardless of whether program was completed in that time frame. When students apply for financial aid, a statement is signed that the funds will be used for educational purposes only. Therefore, if students withdraw before completing the program, a portion of the funds received may have to be returned. Maine Media College will calculate the amount of funding to be returned to the Title IV HEA Federal programs according to the policies here. Information on Tuition & Fees for our college programs, which includes the Professional Certificate in Visual Storytelling, the Certificate in Collaborative Filmmaking, and the MFA in Media Arts Degree.